This picture is more related than you might think.Back again? Awesome! Today in P.C.C, we’re talking Pokemon and mythology, a favorite topic of mine, which seems to get often overlooked. Of course, there’s plenty of mythology in Pokemon, centered on the various legendaries. But that’s not exactly what we’ll be looking at today. Of course, that’s not to say we won’t go there in the future, but there's no reason not to start now! We’ve seen more mythology in the framework of more recent Pokemon, but there are slightly less obvious connections to earlier generations, as well. We’ll be looking at examples from all across the history of Pokemon. Froslass is based on the Japanese legend of Yuki-onna, a ghostly maiden who haunts snow-covered areas. Legends of Yuki-onna vary from one another a fair amount. Some describe her wearing a white kimono, others describe her being naked, with only her face and hair visible while the rest blends in with the snow. In all tales of her, though, she is a tall, beautiful woman with long black hair and pale, almost transparent skin. Traditionally portrayed as the spirit of a woman who perished in the snow, Yuki-onna’s behavior usually revoles around killing lost travelers in snowstorms, often through seduction. One of her most iconic and frequently-told methods, however, is to appear to a traveler as a dying mother, holding a baby. If the traveler takes the baby from her, she will freeze them in place. She has a more gentle side in some legends, however, sometimes sparing her victims for various reasons. In one story, she spared a boys life because she respected his youthful beauty. Legend of Yuki-onna are very prominent ones in Japan, and are worth a read. The legends surrounding it make it a great and abstract choice for a Pokemon. Houndoom is a little more obvious, based off the mythology and folklore-based hell-hound. Hell-hounds are found in various mythologies, usually considered omens or servants of demons. 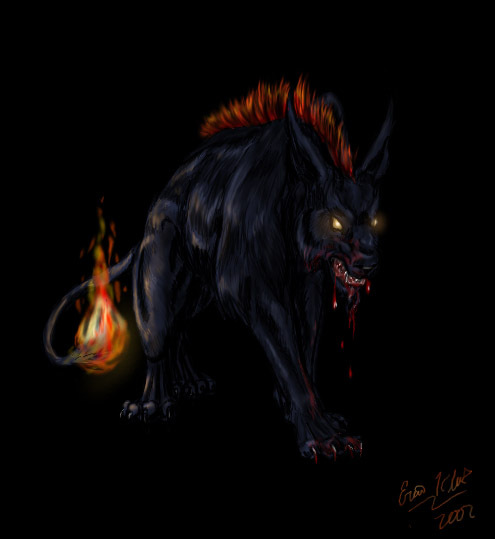 Characteristics usually related to hell-hounds are black fur, glowing red or yellow eyes, super speed and strength, and sometimes even the ability to talk. In cultures that associate hell with fire, hell-hounds can usually breathe fire, or have some amount of control over it. Hell-hounds are also often designated as guards of doors to the afterlife. The most well-known example of hell-hounds in mythology is the Greek Cerberus, a giant three-headed dog said to be the child of the half-woman, half-serpent Echidna, and the titan Typhon. Other examples include hell-hounds as being part of the European legend of the “wild hunt”, and the middle-American and southern Mexican myth of the Cadejo. These three are based on the Hebrew legend of the Leviathan, the Behemoth, and the Ziz. The Leviathan, Kyogre’s basis, is traditionally depicted as a classic sea monster, but has also been portrayed as a giant fish or whale(hence it’s name, which simply means “whale”). The Behemoth, Groudon’s basis, is a giant creature of the land. It has more varied animal depictions, such as a bull, hippopotamus, or elephant. The Ziz, Rayquaza’s basis, is depicted as a giant griffin, who exists to protect birds. It is said that if the Ziz didn’t exist, all birds would be helpless, and die out quickly. It is also said that the Ziz lived atop a tall tower in the middle of a sea, most likely the basis for Rayquaza’s tower in Pokemon Ruby/Sapphire/Emerald. The Leviathan and Behemoth are often described as each other’s counterparts. The Ziz is rarely mentioned together with them, but is still considered their equal, the three together considered as the undefeatable beasts of the sea, earth, and sky. It is said that One day a battle shall take place between the three of them, which shall begin the end of the world. In this battle, the three will kill each other, and man shall eat a final meal of their flesh as the world crumbles around them. Kingdra’s mythological involvement is much more minor, but should still be noted. While mainly based on a seahorse called the weedy sea dragon, many people have speculated it also has basis on the Charybdis, a sea-dwelling creature from Greek mythology. The connection comes from the fact that Kingdra lives at the bottom of the sea and creates huge whirlpools, a trait shared with the Charybdis. The Charybdis was once a very beautiful Naiad, the daughter of the sea god Posioden and the earth goddess Gaia, who was transformed into a sea monster by Zeus. 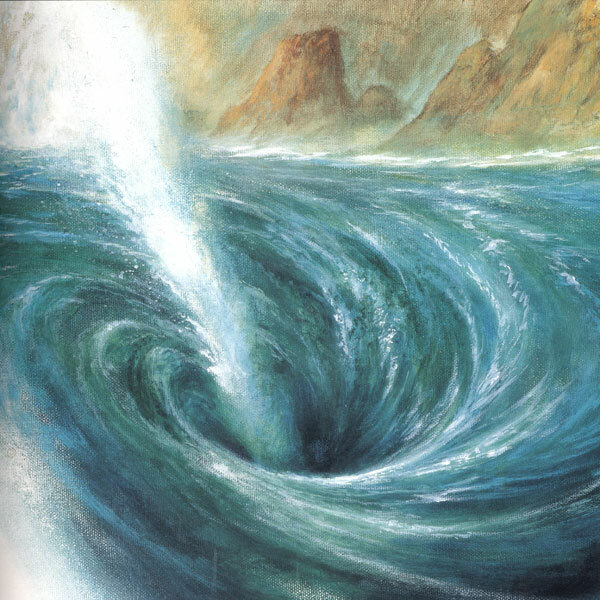 In some variations, Charybdis was transformed into a whirlpool, rather than creating them. So there we have it. Mythology is a gold mine of influence for all sorts of media, with Pokemon being just one example. One other example to come to mind is comic books and graphic novels. There we have superhero personifications of mythological beings, such as Thor and Hercules, as well as influences in the stories told in comics that can be traced back to mythology. In the future we’ll revisit this subject, once Black and White are released here. There are many more myths and legends relating to Pokemon, both new and old. Also, hope everyone's had a great holiday, and will have a great new year too! Thanks to you all for enjoying my articles so far, it's the best christmas present a new writer could ask for.